Like many, I was so excited when the Halo Master Chief Collection was announced, and mildly bemused to note the absence of the ODST section. At the time, I shrugged it off because Master Chief doesn’t appear in it, but the game has always retained a soft spot in my memories. This was largely due to the mixture of multiple viewpoints, gorgeous music, and writing that had both subtlety and simplicity. It was, first and foremost a game of running around and shooting aliens, but there wasn’t so much of the bombastic tone of the main series. My main memory was of feeling more human, more fragile, and part of a team that was struggling to get back together. It was an approach that seemed to be developed in Halo: Reach, but there the theme was reversed, with the experienced team being dismantled over the course of a brutal invasion. 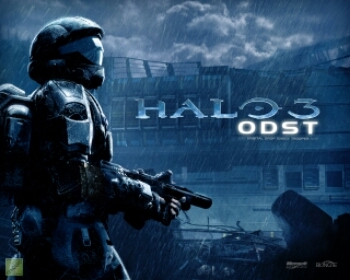 The announcement then that ODST was going to be remastered for free as recompense for the shockingly awful implementation of multiplayer Halo (arguably the element that so many of us had actually bought the collection for) felt something of a mixed bag. I’ve been online a few times with the MCC, but found those early attempts so painful that I’ve been focusing instead on the single player games and their co-op versions, relishing on at least having a good split screen experience to share with people on the couch. So, how is the MCC ODST conversion? The campaign is sitting as a subdirectory of Halo3 in the MCC menus (they use the same, tweaked, graphics engine after all). I’ve been hammering the single player story the last couple of days and it has simply been a joy. The graphical updates are simple, making things seem just that little bit crisper, while the gameplay feels exactly the same. I mean, you’d hope it would, but I did fire it up on the 360 to compare and I can’t tell the difference. I’d forgotten how much I enjoyed crisscrossing the city as The Rookie, picking my route and battles, and the different feel of each specialist’s section keeps changing the flow nicely, breaking up what could have been a monotonous run and gun. The city’s AI, Virgil, is a constant but subtle presence, changing video adverts to point the way, unlocking equipment caches, and even raising and lowering traffic blocks to provide cover during firefight. It’s simple but effective, and I’m developing a great appreciation for this unseen addition to my team. In terms of collectibles, the audio clips I’m picking up are not only filling in back story, but feeding the gamer score craving with a steady flow of 5 points here, 10 points there too. What can I say? I’m a simple soul at heart, easily pleased. And then there’s the music; haunting, bluesey one moment, a military tattoo the next, driving you forward into combat. The soundtrack is so good, you’re going to want to buy it, and fortunately all the major digital outlets have it in stock. Treat yourself. So, if you’re wondering what to do with this free download you’ve got, just dive in and enjoy a piece of background development for the main saga you may have missed first time. For the rest of you, grab it when you get a chance, and remember what Bungie can do when they focus on telling a story. This entry was posted in games, gaming, Geekery, Halo, review, xbox and tagged games, gaming, Halo, MCC, ODST, review, Xbox. Bookmark the permalink.